I thought I’d share today’s “on this day in Tudor history” video with you as it concerns our favourite person, Queen Anne Boleyn. 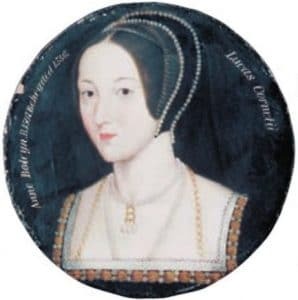 On this day in Tudor history, 12th April 1533, Easter Eve, Anne Boleyn made her first public appearance following Henry VIII’s instructions to his royal council, the previous day, to recognise Anne as his rightful wife and queen. For her first public appearance as Henry VIII’s queen consort, Anne chose to attend mass in the Queen’s closet at Greenwich Palace. She was accompanied by sixty ladies and was described as “loaded with jewels, clothed in a robe of cloth of gold friese”. It must have been quite a spectacle for those at court that day! Find out more about this event in my video below, or click here to read an article on it. What a beautiful and very stunning engraving and a wonderful sight, all in golden robes and all full of jewellery and attended by 60 ladies and now she is publicly prayed for as Queen. Anne must have had a twinkle in her eyes and a feeling of achievement. Of course she wasn’t Queen yet, because Henry was still legally married, but that was going to change once the new Archbishop of Canterbury, Thomas Cramner heard the case at Dunstable Priory later that month. I love that engraving in the article, really beautiful, with her red and green and golden gown and her beautiful regal sleeves flowing down. Today Anne looked like a Queen, even if she has to wait. By now of course she knew that she carried Henry’s child, his hoped for son and heir and now she has the royal dignity. It must have truly been a proud and impressive moment. there seems to be no contemporary paintings of anne, except one of her looking haggard (possibly 1536) and the coin and Elizabeth’s ring. have any paintings been proven to be her? Hi Rose, there is one picture that for me seems to be the truest depiction. That is the one you may find on pinterest, or google search Anne Boleyn hidden portrait. I say that because it is clearly Elizabeth in view, and then in the backround an image of another woman that looks like it had been covered up and is now showing through. The woman fits the description of Anne, also the features are distinctive, a very detailed and very precise work of art, in my opinion. It must have seemed surreal one queen living though banished from court, and Henry V111 parading his mistress around as if she was the real queen, and the mistress herself acting as if she was the queen all dressed in robes of gold and covered in jewellery, her cousin Norfolks daughter holding her train oh my! No wonder as Chapyus stated no one knew wether to laugh or cry, they must have asked themselves what on earth was going on, do we pay obscience to her who had taken Katherines place even though she was not the queen, and if she was the queen then who was Katherine, very bizarre and no doubt Chapyus reported back to Katherine who held steadfast to her belief and prayed to her God for spiritual guidance and strength, by now she reałised that her husband, that once loving man who in the early days had confided in her and had asked her advice on kingship, who had married her in good faith and who had loved her, was now lost to her for ever, in his place was a power hungry King who had been seduced by a woman whom she called ‘ the scandal of Christendom ‘, a wicked woman who had turned the King from the true faith and whilst she Katherine was left to rot in whatever gloomy castle he sent her to, Anne Boleyn was feted like the true queen, there was absolute astonishment in Europe as many must have thought he had lost his mind, but Anne herself was happy and Henry content, she was pregnant and so must have felt a bit nauseous in the mornings and rather tired, her dream however was about to turn into glorious reality Henry had proved his love for her, the stage was set for her ultimate triumph her coronation, the court and throughout the land must have been a buzz with gossip.